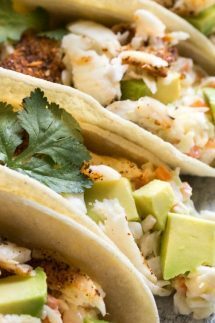 Easy Fish Tacos with Cabbage slaw make a perfect weeknight recipe that you can pull together really quickly. I used tilapia fish fillets topped with my blackened seasoning. They cook very fast on a large sheet pan in the oven. 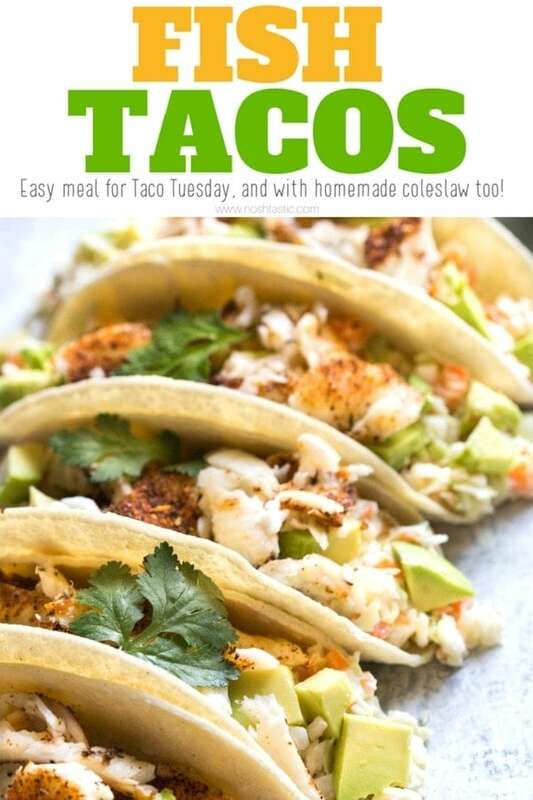 I’ve included a really simple cabbage coleslaw to serve with my Fish Tacos, It’s made from a ready chopped slaw mix with a simple mayo based sauce with green onions, apple cider vinegar and a little celery seeds. Choose a firm white fish such as tilapia, it will cook quickly, has a great taste and will hold together well in your taco. Use my homemade blackened seasoning for the best flavor, it’s gluten free and tastes better than the premixed blends. If you are only cooking a few tacos you can simply cook the fish in a well seasoned cast iron skillet or non stick pan on the stovetop instead of in the oven. You can prepare the cabbage coleslaw in advance if you prefer, it will keep in the fridge. If you want to chop up the avocado ahead of time, just make sure you toss it in a little lemon juice to prevent it from going brown. What is a good side dish for Fish Tacos? I make my own cabbage coleslaw with green onions to serve with my fish tacos. I also like to add avocados, and sometimes I will add in other salad vegetables such as spinach, arugula and chopped cherry tomatoes. They may not be authentic but I like them! A white firm fleshed salt water fish such as Tilapia, Cod, or Snapper are all good choices. It really depends where you live and what is locally available. 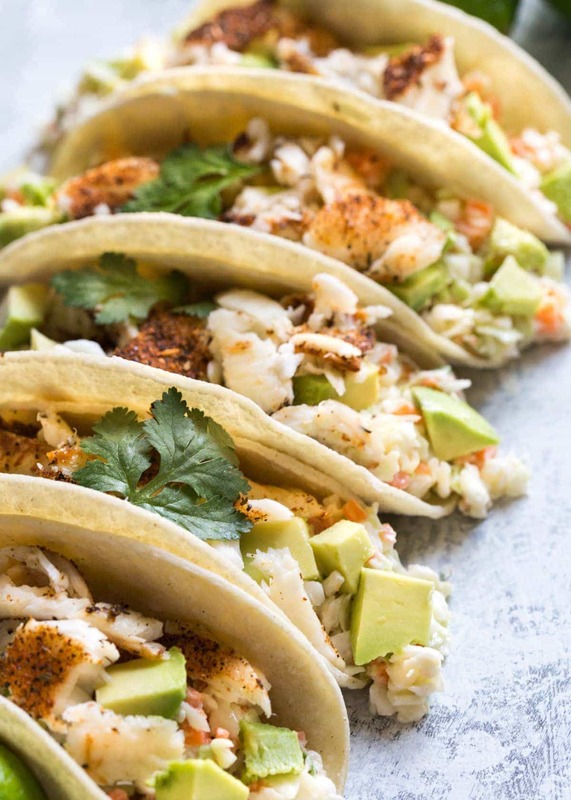 I think that saltwater white fish has a better all round flavor than freshwater fish such as bass or crappie, but I have used them for Fish Tacos too on occasion. Cast Iron Skillet – this is a workhorse in my kitchen and I use it every single day! Parchment paper – I love to buy the precut sheets for convenience, it’s a bit of a splurge but they fit perfectly on the sheet pans and save time on clean up. Mixing bowls – This is a great set and one of my favorites! Easy Fish Tacos with Cabbage slaw make a perfect weeknight recipe that you can pull together in a hurry. Mix the cabbage slaw ingredients together and set aside. Rub the homemade blackened seasoning evenly over all the tilapia fillets. 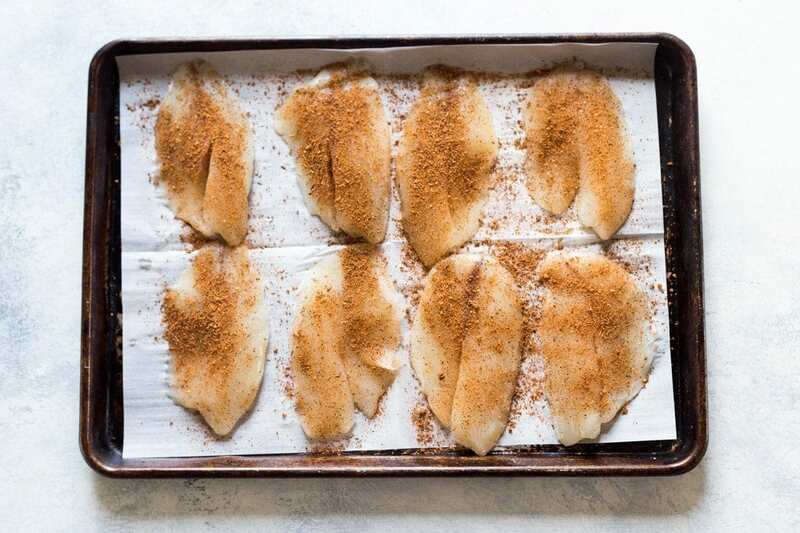 Bake Tilapia in a 350F oven on a sheet pan for 10-15 minutes, or until cooked all the way through. 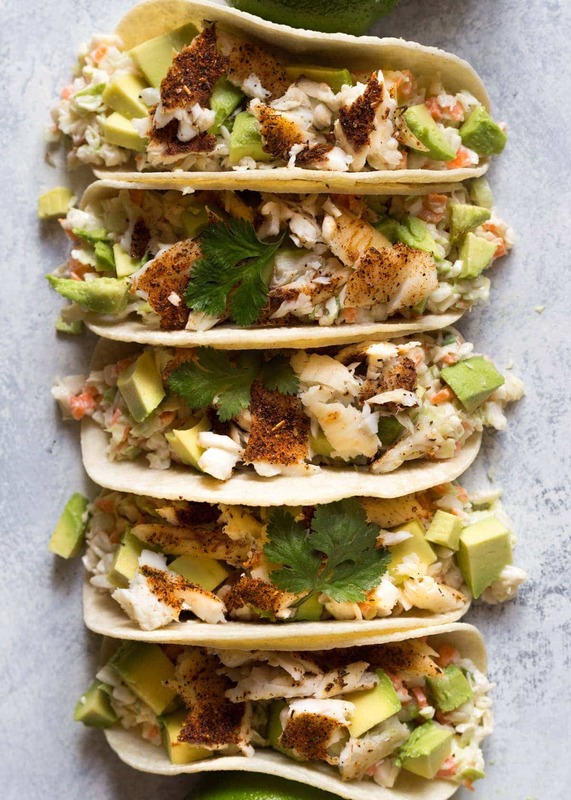 layer your fish tacos with the cabbage slaw, avocado slices and cooked tilapia, serve with a lime wedge.